We might all dream of a huge, family kitchen, but most of us have to make do with something more diminutive. That said, whatever the size of our kitchen, the demands we place on it tend to be the same. We want it to function well as a place to prepare and cook meals. We might also like to be able to sit and eat in there, even if just perched at a breakfast bar. And we need the space to contain a lot of different objects, from chunky appliances to cutlery, crockey and food. The good news is, with some clever planning and great design, it is possible to squish all these functions into one tiny space, as these inspiring spaces demonstrate. It sounds obvious, but where space is tight, it’s essential to make use of all of it. This might mean commissioning bespoke units. Shelves or cupboards designed for your space, rather than bought off the shelf, can exploit even the most awkward corners or weirdly angled roof lines. Luckily, since the number of units you will be able to fit is limited by the small scale of the room, having a bespoke design often works out to be reasonably economical, too. 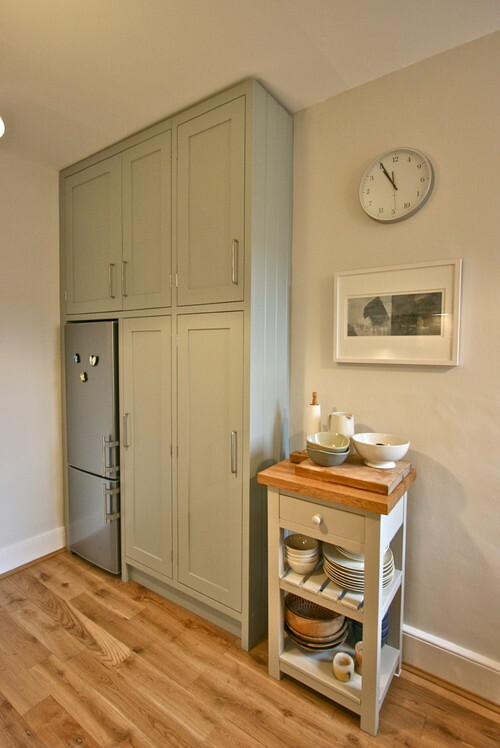 Wall cupboards can eat into the space in a very small kitchen, but you can still make any wall work for you by fitting racks, rails and slim shelves. These can hold anything from saucepans, strung up on S hooks, to utensils, mugs and pots holding cutlery. 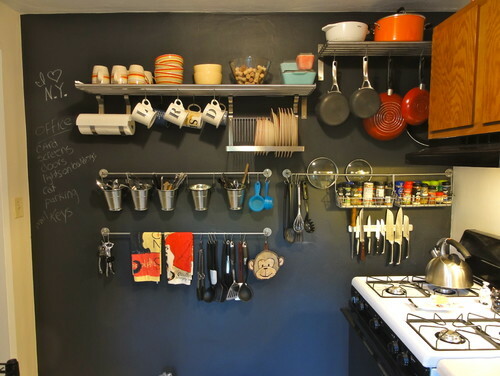 Covering the wall in blackboard paint helps it to multitask further, as somewhere to write shopping lists and messages. Chunky and mismatched pieces will eat into space and make a tiny kitchen feel cluttered. Instead, opt for units with minimal styling and, as here, a worktop that flows over all the base units and even extends to become a breakfast bar. These minimal metal legs keep sightlines open. 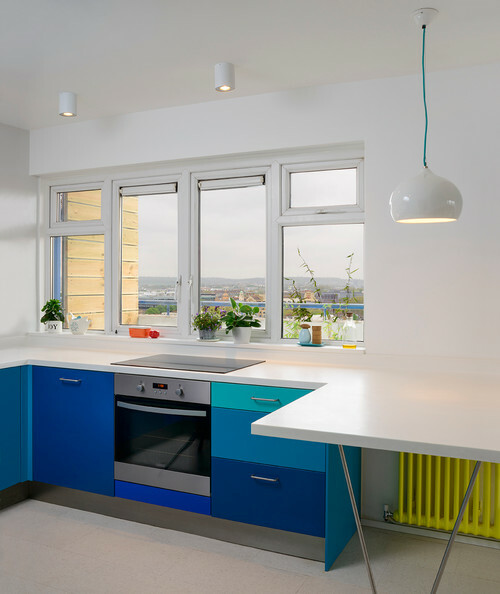 This kitchen is flooded with natural light, so the colour on the unit doors invigorates the space without encroaching on it. 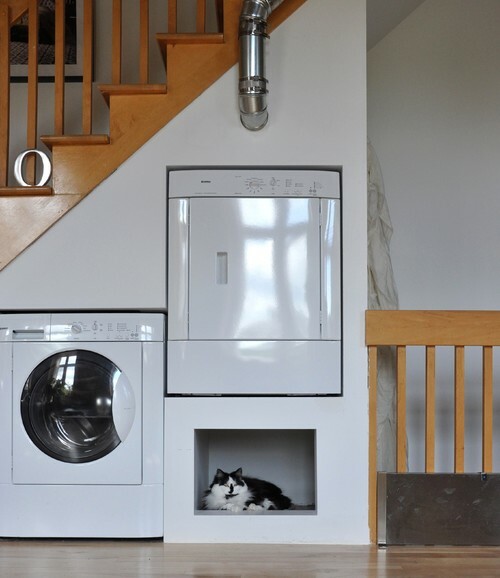 Washing machines and tumble dryers are often installed in the kitchen, but, when space is limited, it’s a good idea to find an alternative home for them. The nook under the stairs can offer the perfect solution, or consider putting a dryer – and perhaps a freezer – in the garage, if you have one. There are heaps of clever space-saving ingredients that can be built into a new kitchen, so if you’re starting from scratch, look out for things like slim spice jar storage, knife drawers, kickboard drawers and integrated chopping boards that slide over a sink or pull out from the wall. 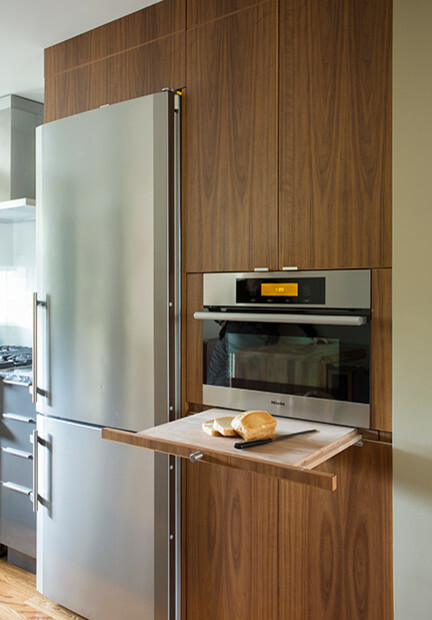 It might seem counterintuitive to fit freestanding furniture into a small kitchen. After all, a freestanding unit does not make quite such efficient use of space. But, if you take the view that where room is tight, it’s important to make every item you place in it shine, then suddenly there is a logic to not building everything in. 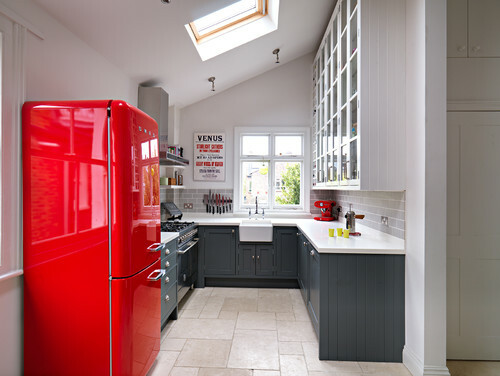 A freestanding piece containing oven, sink and cupboards, like this one, looks like a beautiful piece of furniture that fits elegantly into the space. Rethinking the dimensions of the room and splashing out on some architectural work can make a huge difference to a small kitchen. If yours is in a single-storey space, raising the ceiling to expose the sloping roof line will add a huge sense of light and airiness. It also offers the opportunity to install skylights, which pull in more light than vertical windows. 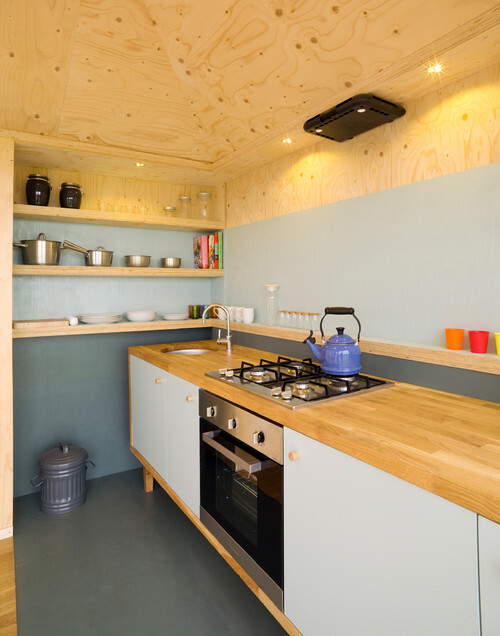 Plus it creates a tall wall against which you can fit cupboards or shelves for maximum storage. 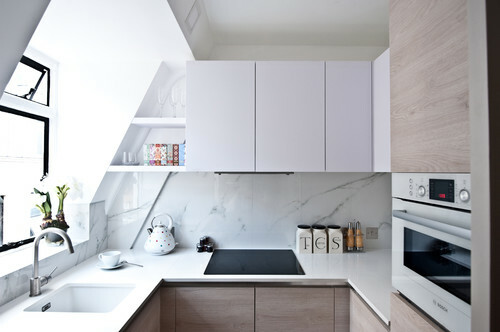 See more small kitchens for inspiration or browse local architects if you’re thinking of extending upwards. 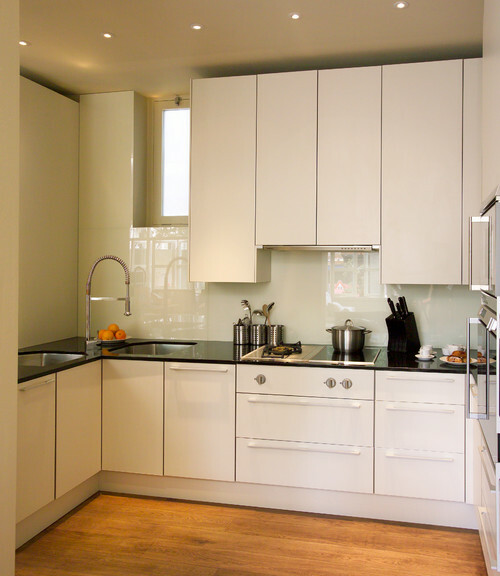 Floor space may be limited, but vertical space is often the same in a tiny kitchen as in a huge one. So make the most of it by building units that stretch right up to the ceiling. Keep infrequently used items on the upper shelves and try fitting sleek handle-less doors, so the units look sleek and seamless and won’t dominate the room. In addition to built-in units, a small, movable butcher’s block with shelves, like this one, can prove incredibly useful. It takes up very little room while supplying additional storage and prep space. It will also create the relaxed, freestanding look you may be craving, but thought you couldn’t pull off in a small kitchen.